With a stay at Econo Lodge Chesapeake in Chesapeake, you'll be within a 10-minute drive of Greenbrier Mall and Norfolk Scope. This hotel is 8.1 mi (13.1 km) from Sentara Norfolk General Hospital and 8.5 mi (13.6 km) from Norfolk State University. Make yourself at home in one of the 93 air-conditioned rooms featuring refrigerators and microwaves. Complimentary wireless Internet access keeps you connected, and cable programming is available for your entertainment. Conveniences include coffee/tea makers and irons/ironing boards, as well as phones with free local calls. Make yourself at home in one of the 59 air-conditioned rooms featuring refrigerators and microwaves. Complimentary wireless Internet access keeps you connected, and cable programming is available for your entertainment. Conveniences include desks and complimentary newspapers, and you can also request rollaway/extra beds. 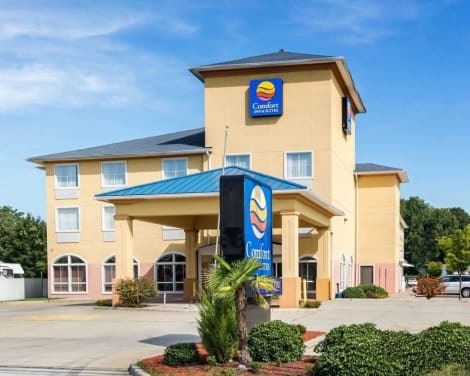 With a stay at Hampton Inn & Suites Chesapeake-Battlefield Boulevard, you'll be centrally located in Chesapeake, within a 15-minute drive of Greenbrier Mall and Norfolk Scope. This hotel is 11.5 mi (18.5 km) from Virginia Beach Town Center and 9.8 mi (15.7 km) from Norfolk Premium Outlets.